of wildlife -- bald eagles, osprey, otters and white-tailed deer -- as you float with professional, courteous and knowledgeable guides. 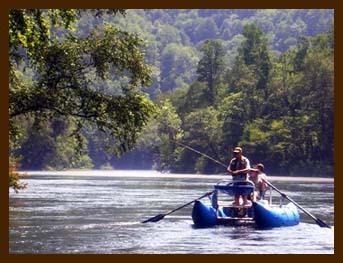 The Toccoa River -- north Georgia's longest cold-water river pours from the dam at Lake Blue Ridge into an 18-mile-long trout fishery that begins just beyond the city limits of Blue Ridge and ends at the quaint border town of McCayesville. The Toccoa's year-round cold water supports a prolific bug and forage population that feeds a thriving trout fishery that challenges the reputation for Georgia's finest tailwater trout fishery. Both wild and stocked brown and rainbow trout take flies of all kinds on the Toccoa , while our anglers follow strict catch-and-release fishing ethics. Strip streamers, tumble nymphs and float dry flies through boulder runs, deep pools, shady laydowns and rippling shoals. 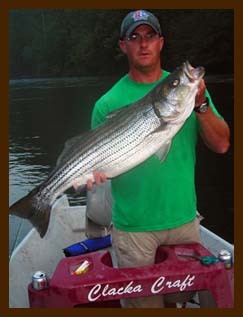 Catches commonly include fish in the 10- to 12-inch range, but trophy brown and rainbow trout... 15 inches and longer! Frequently surprise anglers with smashing strikes, spectacular jumps and driving runs. Even larger trout are sometimes seen... and hooked! 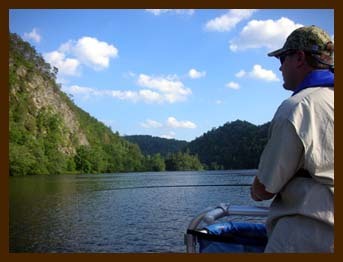 Weather you are a novice or an experienced angler, the Hiwassee River provides you with many opportunities to challenge your fly-fishing and spin-fishing abilities. Wild and stocked rainbow and brown trout are the feature fish on the river, which includes a designated "quality" zone where the trout run large. Smallmouth bass are a feature fish lower in the valley, and we've got a few secrets that can put anglers on the fighting end of a tussle with striped bass! When the power generators at Smith Creek Powerhouse are running, our drift-boats carry you to the pools, runs, lanes and holes where trout take flies, spinners and spoons. When the generators are off it is a wading angler's paradise, with miles and miles of river that can be accessed on foot. Permitted and supported by the National Park Service / Chattahoochee NRA. The most southerly of US trout fisheries east of the Mississippi River, the Chattahoochee River -- the river that flows through Atlanta -- has long been the mainstay of suburban-bound trout anglers of the South. For almost 50 miles, the Chattahoochee River flows cold from beneath Buford Dam, sustaining brown and rainbow trout in both great numbers and trophy sizes. It's a river of changing faces as it winds over gravel shoals, between heavy laydowns, through boulder-strewn "gardens" and deep-green pools, past large suburban tracts, and around public park areas. The float-trips offered puts you in touch in all seasons with both rainbow and brown trout, whether you're fly-fishing or spin-fishing. All trips include transportation to and from locally strategic pick-up points, properly scaled tackle (if needed), our recommendations for your selection of seasonally chosen dry flies and nymphs, soft drinks and bottled water and a selection of photos for your memories. Full-day trips also include a deli-styled lunch.